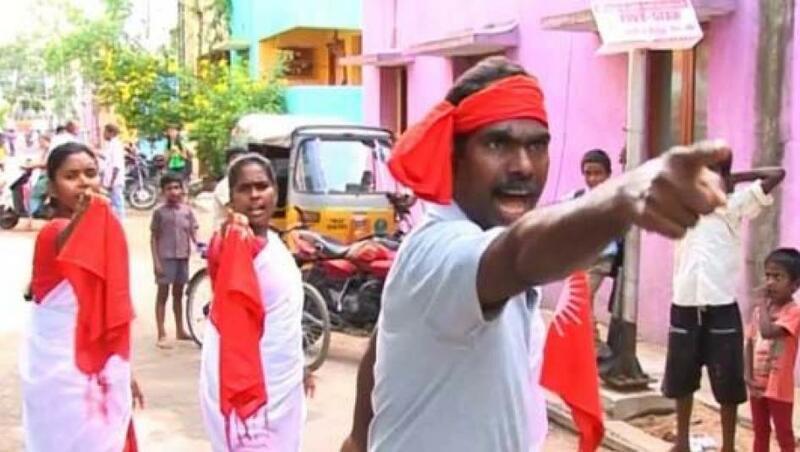 Chennai, April 14: Tamil folk singer Kovan has been arrested in Tiruchy for singing the viral Rath Yatra song slamming Prime Minister Modi and the Bharatiya Janata Party at a recent protest against the non-formation of the Cauvery Management Board. The police who entered his home on Friday arrested him after a scuffle with his friends and family, who demanded to know why he was being taken into custody. Footage that has emerged from the arrest show policemen and Kovan’s friends getting into a heated argument with police officers, who shoved past the folk singer’s friends, who were blocking their entry. The police eventually bundle Kovan into a waiting van. Kovan has been booked under IPC sections 153a (Promoting enmity between different groups), Section 504 (Intentional insult with intent to provoke breach of the peace) and, 505(1b) (Whoever makes, publishes or circulates any statement whereby any person may be induced to commit an offence against the State or against the public tranquillity). He has since been granted bail by a court in Tiruchy. The Rama Rajya Ratha Yatra commenced from Ayodhya on February 13 and entered Tamil Nadu on March 23. It was met with stiff opposition from political parties in the state with section 144 clamped in the district of Tirunelveli. The song uploaded on Kovan’s Facebook page made a mockery of the Rath Yatra and PM Modi for the BJP’s divisive politics. Kovan and his troupe of folk singers and dancers also talk of how Modi’s slippers, much like Rama’s are ruling Tamil Nadu. The song went on to equate Modi rule with the rule of Rama, the hero of the epicRamayanawho is worshiped by Hindus as an avatar of Vishnu. “Rama rajya is Modi rajya, even if you are an Aryan stooge, your destruction is for sure,” the lyrics read. This wasn’t the first time that Kovan has been arrested. In October 2015, the Tamil folk singer was arrested by the police on charges of sedition, attempt to create enmity between social groups, and sale of defamatory material. On that occasion, Kovan had taken on the Tamil Nadu government’s liquor shops – TASMAC – and made references to the then Chief Minister Jayalalithaa. His arrest was slammed by human rights organisations, social activists, political parties and student bodies at the time.